(Of course you'll need to be logged in, and know where you have stored your photo within the computer's filing system). 1. Click the NEW DISCUSSION button and when the window opens, choose your category, insert a title, type in your message, and add TAGS if desired. 2. To post a photo, click ATTACH A FILE which appears just above POST DISCUSSION button. Click the gray BROWSE button which opens just beneath it. 3. This opens your computer's file upload window. Navigate your computer's files until you find the photo file you wish to upload. Highlight that file, and click OPEN in the upload window. 5. Click SAVE. Your discussion and its photos will be posted. 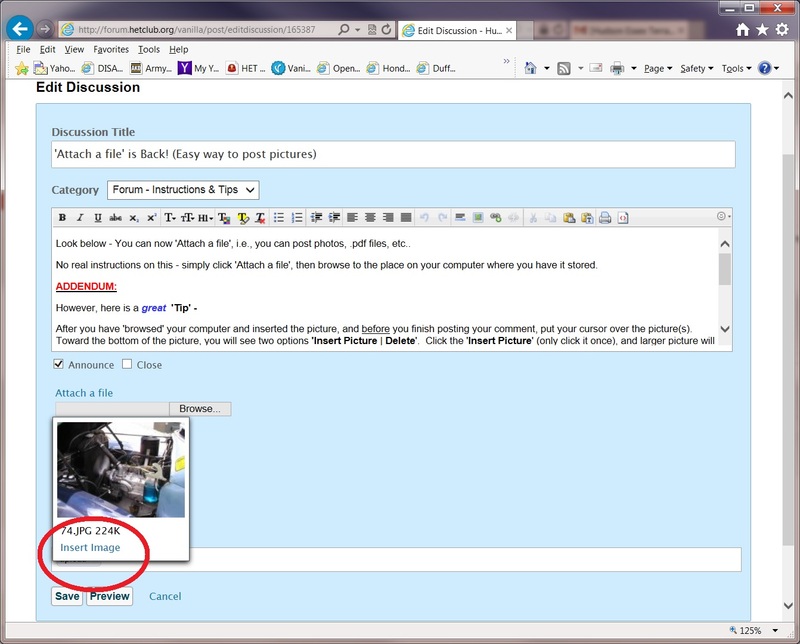 You can go back and EDIT your discussion at any time, and add or remove photos from it. When you are finished editing, click SAVE and the edited post will be published. 1. Capture the URL (address) of the photo you wish to use. To do this, place your cursor over the photo. Right-click the mouse button. In the menu that opens up, left click on COPY IMAGE LOCATION. Now it's copied to your computer's memory. 2. Start your new discussion at the Forum. (You must be registered and logged in, in order to start a new discussion or reply to an existing one.). When the discussion window opens, choose your category, insert a title, type in your message, and add TAGS if desired. 3. To post the photo, first place your cursor in the approximate location within the message, that you want to post the photo. Left-click, to place the cursor in that position. 4. Now, left-click on the INSERT IMAGE icon. It's the 9th icon from the right side. Looks like a little TV with a green screen. 5. The ENTER URL window opens. Place your cursor on the extreme left end of the white window in that box -- just left of the "http". Now, immediately right-click -- and when the small menu pops up, left-click on PASTE. Now the link to the photo (which you just copied) is transferred here. Be sure there are not TWO ''https'' at the beginning of the URL you just printed. 6. Now, click POST DISCUSSION and your message -- along with its photos -- should be published.